Featuring a terrace and free Wi-Fi, Universitat Apartments a self-catering accommodation in Barcelona. Cafeterias and tapas bars are 60 metres away. Plaça Catalunya and La Rambla are within 700 metres. Offering a balcony, each air-conditioned apartment includes a seating area with a sofa bed and flat-screen TV. The kitchen is equipped with a stove, oven and coffee machine. The 2 bathrooms come with a shower. 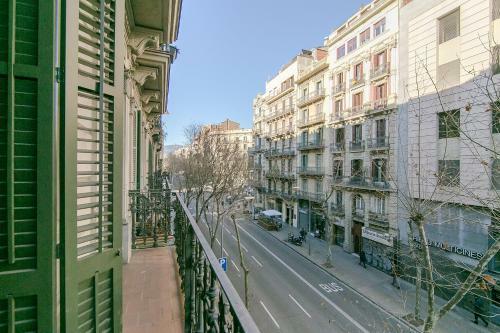 Sagrada Familia, Barceloneta and its port are 2.5 km from the property. Universitat Apartments is 15 km from Barcelona El Prat Airport. Please note that there is a lift from the 1st floor upwards. Please note that early check-in, between 11:00 and 16:00, carries a surcharge of € 25. A surcharge of € 50 is applicable for late check-in after 00:00. Offering a balcony and free Wi-Fi, each apartment includes a seating area with sofa and flat-screen TV. The kitchen is equipped with a stove, oven and coffee machine. There are 2 bathrooms with a shower. Rate: € 170.00 ... € 242.00; select dates below to get current rates. This air-conditioned apartment features free WiFi and a seating area with a sofa and a flat-screen TV. The kitchen is equipped with a hob, oven and coffee machine. There are 2 bathrooms comes with a shower. Bed linen and towels are provided. Air conditioning is available in 2 of the bedrooms only. Rate: € 180.00 ... € 343.33; select dates below to get current rates. This spacious apartment boasts high ceilings and traditional mosaic flooring; and comes with a fireplace and 2 bathrooms completed with a hairdryer. There is a flat-screen TV, a DVD player and a fully-equipped kitchen including a microwave. Rate: € 240.84 ... € 342.00; select dates below to get current rates. This triple room has a CD player, washing machine and dining area. There are 2 folding beds.